Squares highlighted with blue are considered to be adjacent to Elisa. 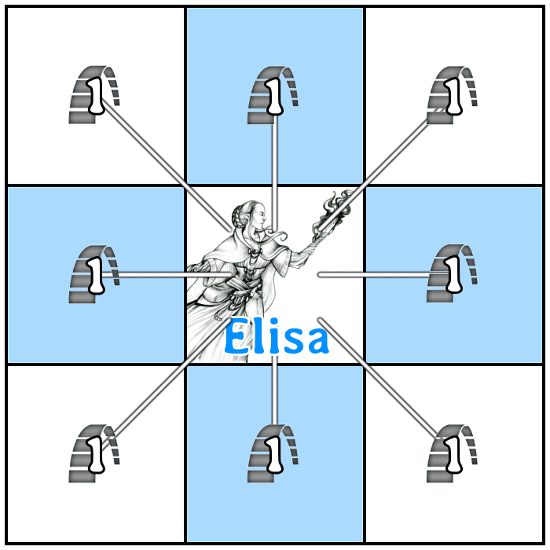 All the 8 squares that are surrounding Elisa are referred to as being at 1 [range icon]. When talking about Threatened squares, it refers to squares which are from Range 1 from any enemy miniature, including the Nest. 1. Olazabal and Simma have already done their turns. Olazabal is Defending and keeping the Rotikkas at bay meanwhile Simma tried and failed to Attack the Rotikka that rushed uncomfortably close during the previous turn. “We’ll hold these little buggers! Elisa, try to figure out a way how to get rid of them before they get all bitey.”, Olazabal shouts as she fends off the two Rotikkas with a couple of brisk kicks. “Don’t worry, I’ve got a plan. Just focus your thoughts on me as I may have to borrow a little bit of juice for a little spell.”, Elisa’s replies calmly. She spends 2 [AP ICON] and lands on the Charge -spoke on the Wheel of Destiny. 2. Olazabal aids Elisa with Rush (+2) and Engineering (+5 for aiding) for the movement part of the Charge action, boosting Elisa’s Charge to 10 [MOVE ICON]. “Hurry up!”, Simma shouts from short hallway right next to the staircase they were moving towards before the two wicked creatures attacked them. “Yes yes, give me a moment.”, Elisa answers. She takes a little bit of distance and attempts to melt the lock of the chest with the build up energy of the spell she’s preparing. 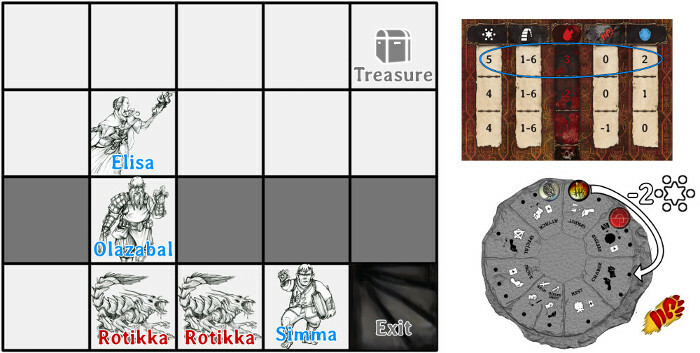 She uses the remaining 7[MOVE ICON] for lock picking attempt and then draws two response cards for determining the challenge value of opening the chest. 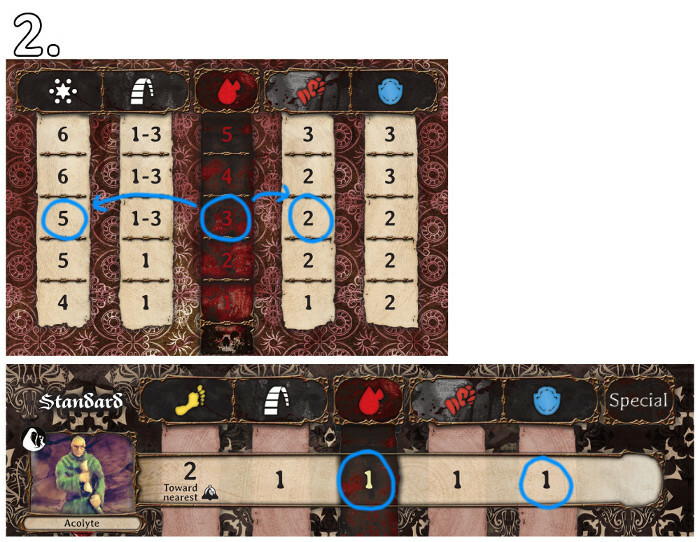 The results of the two response cards are 2 and 3, meaning that the total challenge rating is 5. 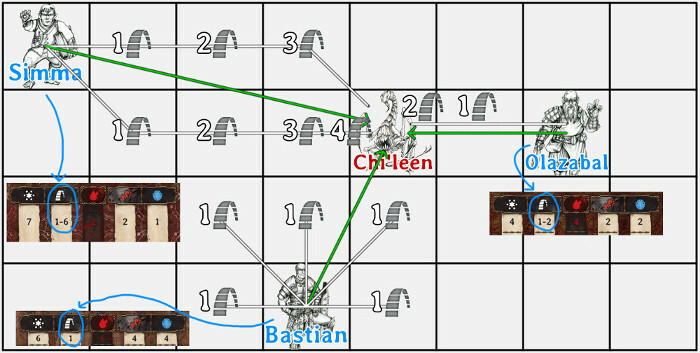 7[MOVE ICON] exceeds the challenge rating 5 of the chest, and thus Elisa succeeds in her attempt, and the chest is open. 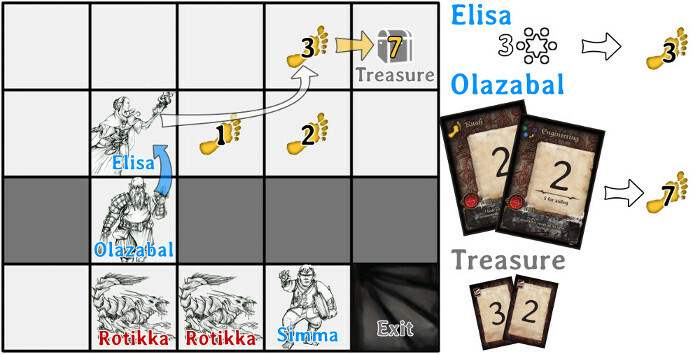 Elisa isn’t quite able to resist her curiosity regarding what the chest was used to contain, so she draws the topmost card of the Treasure deck, which turned out to be a Plate Mail (+2 [Defense icon], -1 [AP ICON], usable to Warriors). She places the card next to her Hero Sheet’s backpack slot. “Ah, a little gift for the more… hmmm… burly members of our party.”, she whispers, pleased that the chest had not been used to contain anything that the cult might consider to be of value. Whatever that might be then… Something that is sorely in need to be purified with fire, for sure. 3. “Alright! Olazabal, heads up!”, she shouts a moment before she launches her Focus (+2) boosted Fireball (5 [ATTACK ICOn] in total] towards the alcove Olazabal is standing in. 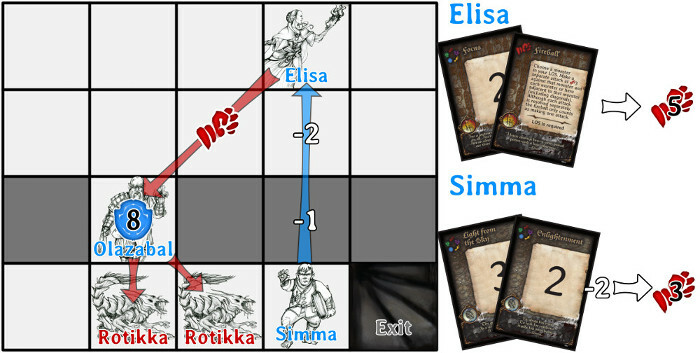 Simma also aided Elisa’s Fireball spell with Light from the Sky (+3) and Enlightenment (+2) cards, further boosting the Fireball by the 3 (- 2 for the distance between him and Elisa). The Fireball hits the alcove with the heftily boosted strength of 8[ATTACK ICON]. 1. Guard has LoS to Simma but Simma cannot see the guard for he is not directly adjacent to the arrowslit. 2. The same as 1. 3. Neither Niffil nor the Guard have LoS to each other. Niffil only has LoS to the square above the Guard and guard is not adjacent to the arrowslit. 4. No LoS either way. The line drawn between the centers of the squares occupied by Elisa and the guard goes through a wall. 5. No LoS either way. Neither Elisa nor the guard is directly adjacent to the arrowslit. Important: LoS can be determined through an arrowslit square if the figure is adjacent to the square and the figure is aligned to the square so that the slit is facing to the figure. In any other case the square is considered to be wall. 6. Neither Olazabal nor the guard has LoS to each other because Rotikka is in the way. 7. No LoS either way because the LoS can only be determined up to a range of 6 squares. 8. 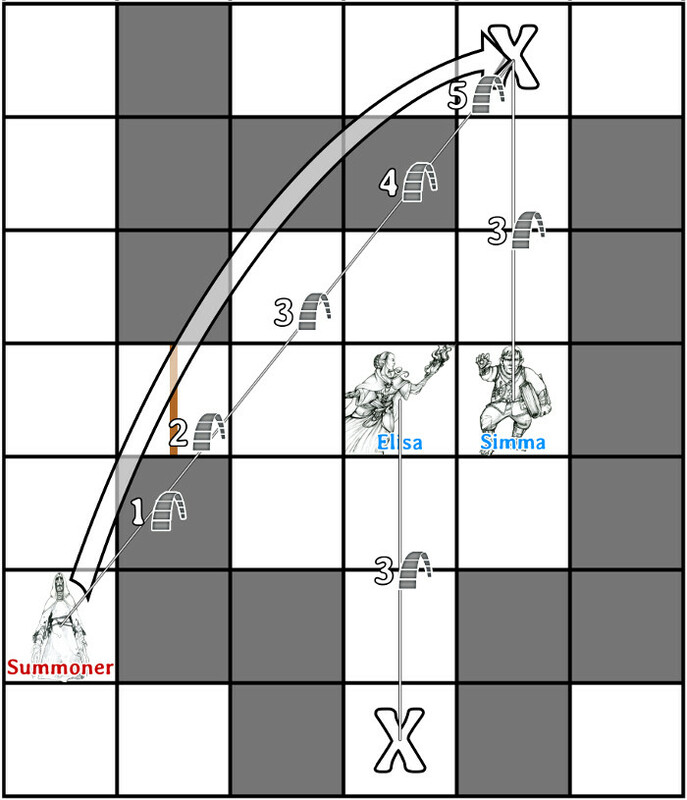 LoS can be determined both ways between Neshilim and the summoner as the LoS-line is allowed to cut one, and only one, corner. 9. 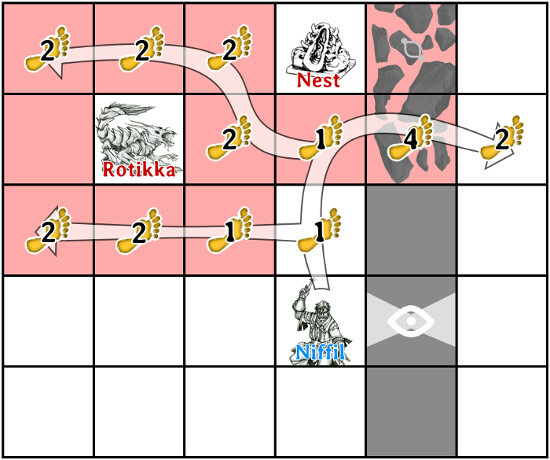 LoS cannot be determined between Neshilim and the summoner as the LoS-line cuts two corners. 1. 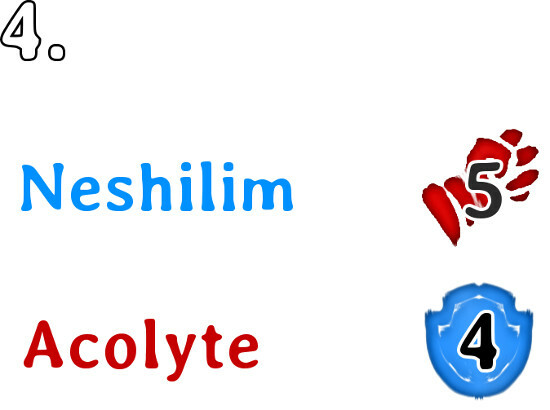 Neshilim decides to attack the Acolyte before it has time to escape and raise an alarm. He spends 1 [ACTION POINT ICON] to move his peg on the action wheel from Special-action spoke to Attack-action spoke. 2. Since he has taken a couple of hits, after choosing to Attack he has 4 [ACTION POINT ICON] left out of the 5 [ACTION POINT ICON] he had at the start of his turn and his base attack value is 2 [ATTACK ICON]. The Attack -action allows him to spend the remaining [ACTION POINT ICON] to boost his attack value to 4 [ATTACK ICON]. As the Acolyte seems like a rather wimpy opponent he feels relatively confident that he is able to take care of the abomination serving coward without too much of a problem. 3. The fight begins. 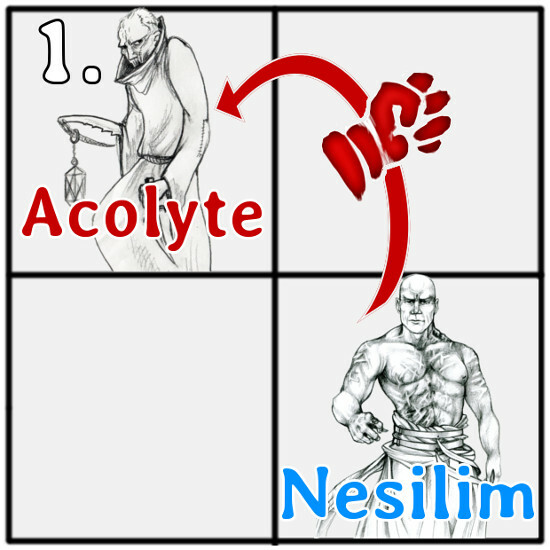 The Acolyte’s base defense value is a measly 1 [DEFENCE ICON] but it is no reason for being careless with his moves. After all, even a tiny rat can defend itself fiercely if cornered. He decides to boost his attack by 1 by utilizing his Eagle Stance martial art technique. 4. A wise move from him. 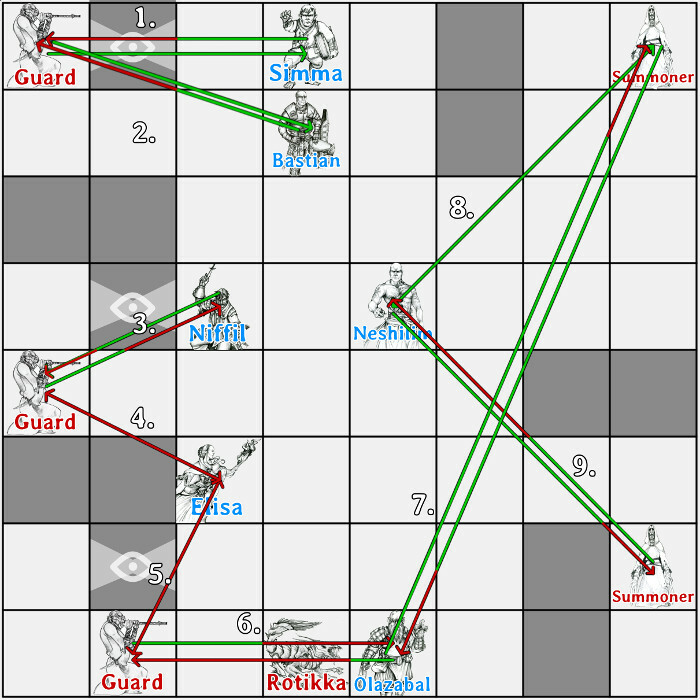 The panicked Acolyte pulls out a dagger and tries to fend Neshilim off to the best of his/its ability (response card result: 3) but in the end a far superior technique beats hapless swinging as 5 [ATTACK ICON] is more than 4[DEFENCE ICON]. The empty hallway echoes the sound of a breaking bone for a brief moment and the Acolyte collapses to the ground lifeless. Simma’s is at full health which means that his attack range is 1-6. He has LoS to chi’leen and the monstrous being is 4 squares away from him regardless of which way the shortest route to Chi’leen is counted. At range 4, chi’leen is well within Simmas attack range this turn! Olazabal is a melee hero, but at full health her (dwarven women can and most often do grow beard) range is 1-2. She planning to attack chi’leen and as she has LoS to the creature and it is also within her attack range, she’s glad to apply her engineering skills for making the world a better place by the measure of one ugly bug. As much as Bastian would also love to join the attack against the surrounded chi’leen, he’s unable to do so. Bastian is a melee fighter and his range is 1 (=adjacent squares). While he does have a clear line of sight to the foul insectoid, he lacks the range for trying his weapon against the chitinous exoskeleton of the chi’leen. The Summoner is planning to teleport. The two Xs mark the the spots where it would be furthest away from the two heroes while still maintaining Line of Sight and range it could attack from (1-6 [range icon]. 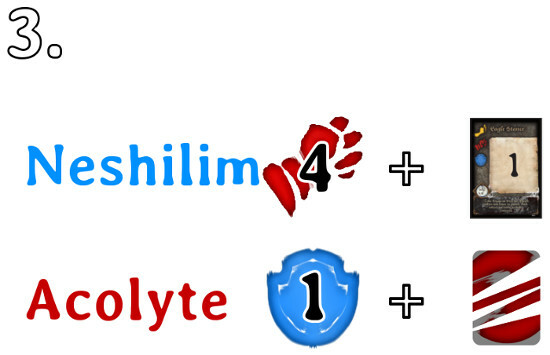 The Summoner can sense that both of the heroes are completely unwounded (Elisa 3[health icon] & Simma 2[health icon]). But one of the two heart beats in the room is slightly weaker (Simma’s), a piece of information it uses to deduce that Simma is the weaker one of the heroes. Thus it decides to teleport to the upper one of the two Xs, which is still well within its reach, and starts mentally preparing for attacking Simma.